Instant Replay Review upheld 1B Umpire Quinn Wolcott's out call in the top of the 8th inning of the Rays-Royals game. With two out and none on, Rays batter Will Myers hit a 1-0 change up from Royals pitcher Jason Vargas to second baseman Danny Valencia, who threw to first baseman Eric Hosmer as Myers arrived at first base. 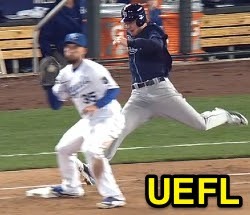 Upon Instant Replay Review as the result of a challenge by Rays Manager Joe Maddon, Wolcott's ruling that Hosmer caught the ball and tagged first base prior to Myers' touch arrival was affirmed, the call was correct. At the time of the review, the Royals were leading, 4-0. The Royals ultimately won the contest, 4-2. This is Quinn Wolcott (81)'s first Instant Replay Review of 2014. Quinn Wolcott is now 1/1 (1.000 Affirmation Rate) in Instant Replay Reviews during 2014. Crew Chief Gerry Davis' crew is now 2/2 (1.000 Affirmation Rate) in Replay Reviews during 2014. This is the 47th Instant Replay Review of the 2014 MLB Regular Season. Rays Manager Joe Maddon is now 2/3 (.667 Success) in Instant Replay Reviews during 2014. Umpires are now 31/47 (.660 Affirmation Rate) in Instant Replay Reviews during the 2014 MLB season.